It’s hard to believe that a year ago, Google and Apple were still best friends. Google CEO Eric Schmidt was on Apple’s board. Plenty of Google employees proudly showed off their iPhones. All seemed fine as the two companies took on their common enemy, Microsoft. 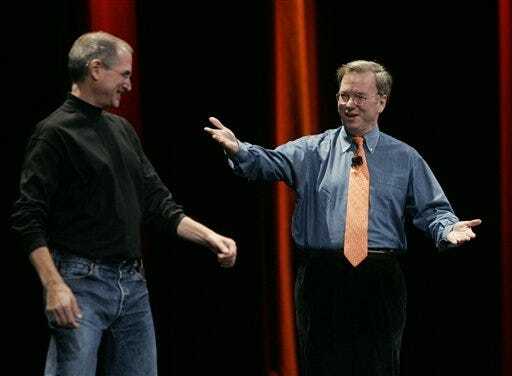 Today, Eric Schmidt is off the Apple board, gone since last August. Googlers wave their new Google Nexus One Android phones around. Apple CEO Steve Jobs makes remarks about Google wanting to kill the iPhone. Schmidt suggests the iPad is nothing more than a big phone. What happened? Google, the company that seems to know no bounds, went too far for Apple. It pushed its own browser, Chrome. It pushed its own mobile-phone platform, Android. It pushed its own operating system, Chrome OS. It transformed from Apple partner into Apple competitor, encroaching into key Apple product areas. The change has left Apple particularly vulnerable. Search is a big part of the iPhone. Search is built into Apple’s Safari browser. And Google is the search provider of choice with both, through deals that have never been well publicized or explained. If Apple’s so unhappy with Google, maybe it needs a new search provider? Unfortunately, the only real alternative would be Microsoft’s Bing. So who does Apple hate less these days, Google or Microsoft? That might dictate the choice it makes. But then again, how about some sweet revenge? Why doesn’t Apple build its own search engine and take on Google! That might sound great, but building a search engine is hard. Damn hard. Just ask Microsoft, which has spent hundreds of millions of dollars to build its own and millions more to market it. Even then, Bing has barely made a dent against Google. It was no iPhone-like product that revolutionised an existing market. But couldn’t Jobs work some of his magic and transform search in a way that would cause people to flock to an Apple search engine? I doubt it. When you ask people what they most want in search, it’s relevancy and speed. A pretty user interface is far down the list. And developing a relevant search engine is incredibly hard. You need many engineers skilled in search, which Google and Microsoft are already fighting over. You need to pull back billions of pages. You need lots of data centres for blazing speed. An easier way forward would be to buy someone else’s technology and improve it. Yahoo would have been a great fit — but Yahoo’s going to Microsoft now. There’s Ask, but it has lost talent over the years. Building from scratch isn’t impossible. But by the time you build your search engine to today’s levels, your competitors have probably moved far past you. If you do get past the technological hurdles, you still have to fight an ingrained habit consumers have to use Google. Here’s one example: Microsoft cut a deal to be the default search provider for some Verizon phones. After that change was made, some Verizon users were so upset that Verizon had to write a special blog post explaining how to get back to Google. If Apple flips the search switch to something other than Google, plenty of Apple fans will be demanding a way to change that. Plenty of others may question why the change was made at all. Is it really because there’s a better search engine out there for them to use? Nothing is impossible, and Apple’s got an enviable reputation for game-changing. But I wouldn’t bank on similar success when it comes to search.